Talc Free Baby Powder – USDA Certified Organic Dusting Powder by Honeybuns Non-GMO, Cruelty Free, Natural and Organic Baby Products. KEEP YOUR BABY COMFORTABLE OR YOUR MONEY BACK. Gentle, nutrient rich dusting powder with Organic Arrowroot Powder, Cornstarch, Kaolin Clay, Calendula Extract and Rosemary Extract. START OFF ON THE RIGHT FOOT. Avoid harsh chemicals and toxic ingredients found in other baby products. Talc-free, fragrance free, non-toxic, 100% natural and USDA Certified Organic. MADE FOR SENSITIVE, IRRITATED SKIN – Perfect for dry, cracked, chapped or damaged skin with gentle, nourishing ingredients. Use in replace of talcum powders in shoes, diaper rash, etc. Works great with cloth diapers. KEEP HEALTHY SKIN HEALTHY – Help keep skin soft, supply and protect from excess moisture. Perfect for men, women, kids and of course infants. BUY WITH CONFIDENCE – We want you to love your baby products. So if Honeybuns Organic Baby Powder isn’t right for you, get a full refund thanks to our 60 day money back guarantee. But now with confidence thanks to our 60 day money back guarantee. Posts related to Talc Free Baby Powder - USDA Certified Organic Dusting Powder by Honeybuns Non-GMO, Cruelty Free, Natural and Organic Baby Products. 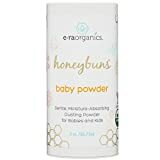 This entry was posted in Organic Health Products and tagged Baby, Certified, Cruelty, Dusting, Free, Honeybuns, Natural, NonGMO, Organic, Powder, Products., Talc, USDA by Organic Health. Bookmark the permalink.